KLM and Alitalia are showing flights from Calgary to Florence, Italy (FLR) as far away as April 2016 for just $676 CAD roundtrip including taxes. Florence (FLR) is also the airport you want to fly into if you're planning to visit the famous Tuscany wine region of Italy. 1. Go to ITravel2000.com and click on the 'Flights' tab. 2. Search for a flight from Calgary (YYC) to Florence, Italy (FLR). There are dates available at this price between November 2015 and March 2016, but below I'll list some example dates for April 2016, when the weather starts to climb back up to over 20C+ in Florence. You can also try mixing and matching the departure and return dates from above. If you want to try searching for your own dates in other months, focus on flights that both depart and return on Mon/Tue/Wed/Thu. Where to stay in Florence (Tuscany) ? The following AirBNB link will lead you to some great deals on places to stay in Florence for under $99 CAD/night for 2 people. calgary, yyc, flight deals, europe, southern europe, western europe, italy, klm, florence, flr, alitalia and tuscany. 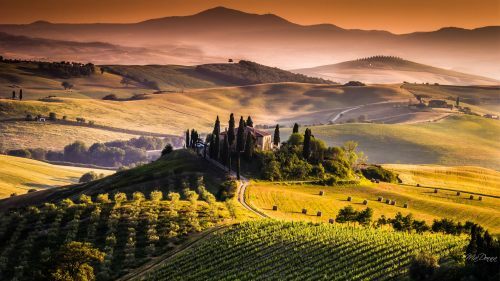 5 Responses to "Calgary to Florence, Italy (aka Tuscany) - $676 CAD roundtrip including taxes"
Thanks Chris for the heads up on this great deal!! we booked from April 17th to 28th, so excited!!! Looked like sale only apply to April, and earliest date is March 28th. Booked. Woohoo! Thanks Chris. Thanks Chris! We are booked and totally thrilled! Excellent! Have a great time in Italy everyone! The broken link to ITravel2000 has been fixed. 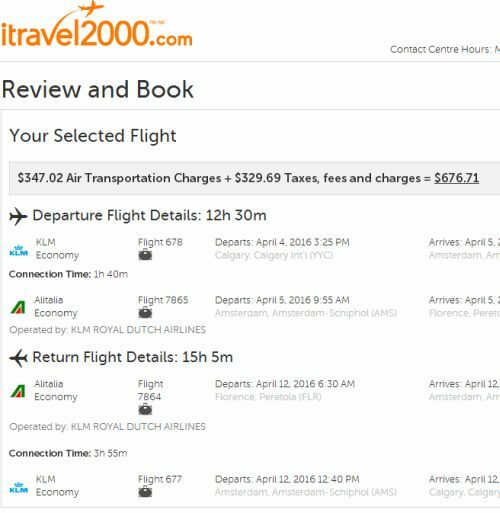 As of 10:11AM MST - April 11 to 20 is still coming up as $676 CAD roundtrip including taxes. Haven't tried all the other combinations.